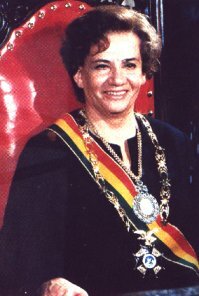 Lidia Gueiler Tejada (born August 28, 1921 in Cochabamba) was the first female President of Bolivia, serving in an interim capacity from 1979 to 1980. She was Bolivia's first (and thus far, only) female Head of State, and the second in Latin American history (First female one was Isabel Peron in Argentina between 1974-1976). Gueiler was born in Cochabamba, and studied to become an accountant. In the 1940s she joined the Movimiento Nacionalista Revolucionario (MNR). When that party came to power as a result of the 1952 National Revolution, Gueiler became a member of the Congress of Bolivia, serving in that capacity from 1956 until 1964. In 1964 she went into exile abroad, after the MNR was toppled from power by generals Barrientos and Ovando. She spent the next fifteen years out of the country, and joined Juan Lechín's Revolutionary Party of the Nationalist Left (PRIN). Upon returning to Bolivia in 1979, she again ran for congress and was elected President of the Chamber of Deputies of Bolivia (the lower house of the Bolivian congress) as part of the MNR alliance of former president Víctor Paz Estenssoro. Since no presidential candidate in the 1979 elections had received the necessary 50% of the vote, it fell to Congress to decide who should be first executive. Surprisingly, no agreement could be reached, no matter how many votes were taken. An alternative was offered in the form of the President of the Senate of Bolivia, Dr. Wálter Guevara, who was named temporary Bolivian President in August 1979 pending the calling of new elections in 1980. Guevara was shortly afterwards overthrown in a military coup led by General Alberto Natusch. The population resisted, however, led by a nationwide labor strike called by the powerful Central Obrera Boliviana ("COB") of Juan Lechín. In the end, Natusch was able to occupy the Palacio Quemado for only sixteen days, after which he was forced to give up power. The only face-saving concession he extracted from Congress was the promise that Guevara not be allowed to resume his duties as president. This condition was accepted and a new provisional president was found in the leader of the lower congressional house, Mrs. Lidia Gueiler. As interim President, Gueiler was entrusted with the task of conducting the nation to new elections in 1980. Before these could be held, however, Gueiler herself was overthrown in a bloody right-wing military coup by General and her own cousin Luis García Meza. Gueiler then left the country, and lived in France until the fall of the dictatorship in 1982. Later, she served her country mostly in the diplomatic sphere, having been appointed Bolivia's ambassador to first Colombia, then West Germany, and finally -- after joining Jaime Paz's "Movimiento de Izquierda Revolucionaria" -- to Venezuela (1989). She retired from public life in the mid 1990s. Mrs. Gueiler has been involved in various Bolivian feminist organizations throughout her life. She opposed the U.S.-backed war on drugs in Latin America, particularly the so-called Plan Colombia. In addition, she has written two books, publishing La mujer y la revolución ("The woman and the revolution") in 1960 and her autobiography, Mi pasión de lidereza ("My passion as a leader") ), in 2000. In the 2005 election she supported the candidacy of Evo Morales. In June 2009, Mrs. Gueiler accepted the role of honorary president of the Human Rights Foundation in Bolivia.